Frequency response and stereo imaging not great, has artifacts in high end due to over denoising. Probably would have been B otherwise. We have a tape copy of this but it may be higher generation than this (although probably will sound better due to no denoising). Will transfer soon. If you have a low gen tape contact us. Foolish Heart was played at the honolulu dates. plus i am certain this is the 3rd show in Hawaii as you can here steve say 'i guess this is the 3rd night' just before Girl cant help it. lots of different show claim to be different dates but i have only ever seen the 18th. 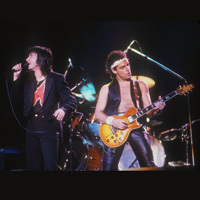 chicken wrote: Foolish Heart was played at the honolulu dates. plus i am certain this is the 3rd show in Hawaii as you can here steve say 'i guess this is the 3rd night' just before Girl cant help it. lots of different show claim to be different dates but i have only ever seen the 18th. Yeah, looks like I missed that out on the track listing, fixed now. I think the 17th should be correct, Register to view links.